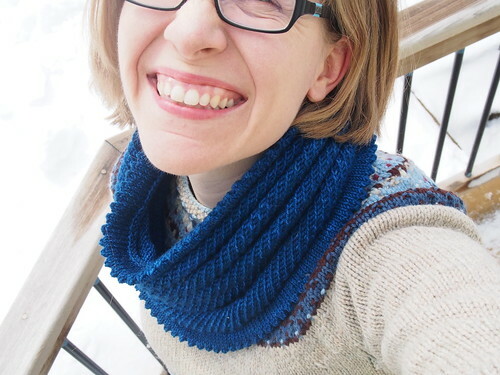 So here, I present: My CCCC 2018 Cowl! Yarn: Mystery deep blue sock yarn – it came in a GMDS package awhile back, that much I know, but I lost the label so I don’t know anything more about it! Time to knit: 5 days! 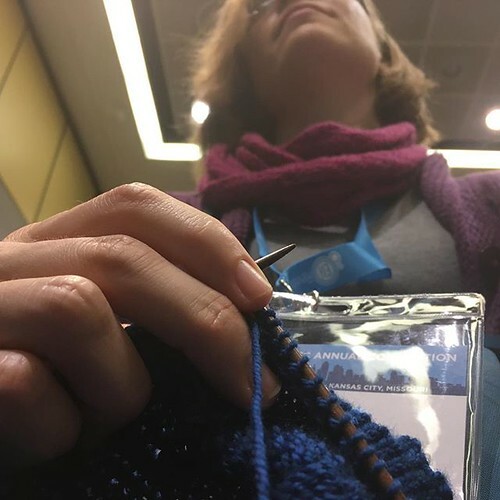 I made a new knitting friend – one of my fellow presenters for the workshop I was part of is also a knitter so we became Ravelry buddies during the conference! 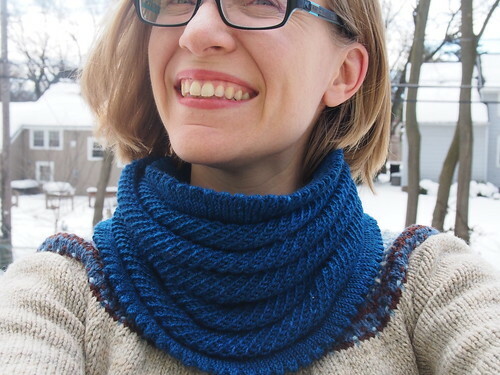 I just adore how this cowl looks, and I find it so fascinating the way the long tube folds on itself with those eyelet mesh bands. I stepped out on our deck to take Real Camera pictures of the cowl today – we have a deck! It’s so lovely! I’m still getting used to New House, but it’s a really great house…we just have to get Old House sold now, and keep unpacking. It’s no fun at all to be in the middle of a move while also in the middle of a very busy semester, but hopefully I can keep on hanging on and not deprive my students TOO much. I hope all of my fellow Northern folks are staying warm while we wait for Spring to actually arrive! Have a lovely Equinox this week, everyone! I’m about to head out to Kansas City for the 2018 CCCC Convention, presenting in one of the Wednesday afternoon workshops (AW.12, if anyone reading this is also headed to 4C’s!) and this year the weather isn’t going to thwart me! 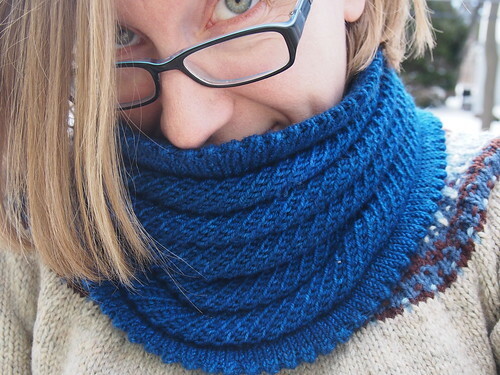 (Oh hey, I should actually weave in the ends and sew a zipper on that sweater I was wearing in that post last year!). 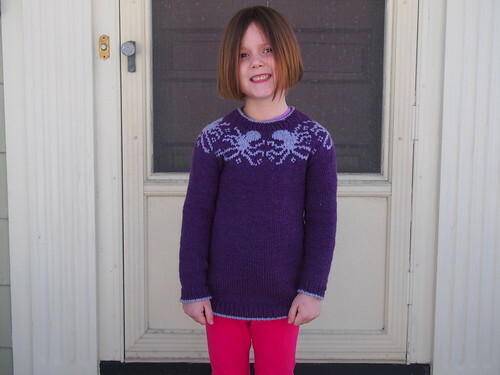 Last night, as our last mama-daughter activity before I’m away for 5 days, M came with me to Knitting Guild so that she could Show & Tell her Octopus Yoke sweater. 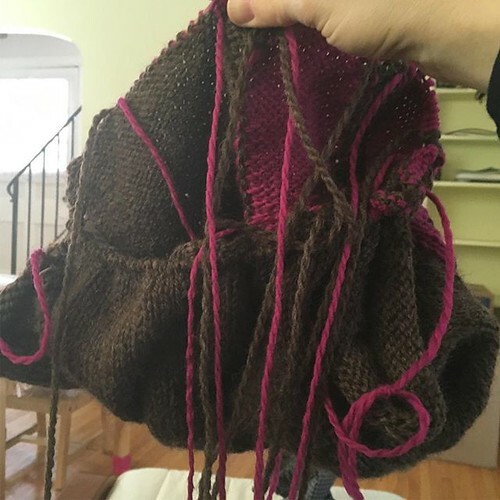 Because everything is still a crazy mess due to the move, I couldn’t find her knitting bag (of course, I found it first thing after we got home! 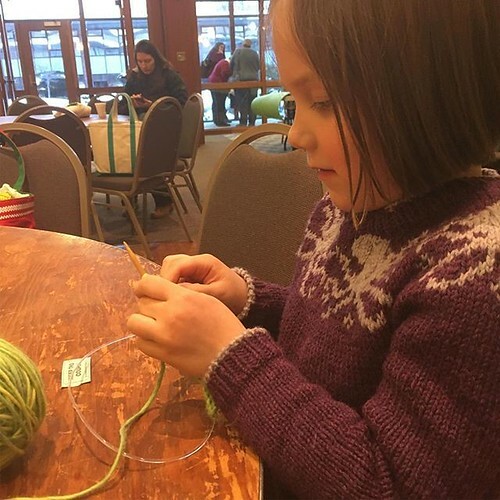 ), so I hastily cast on a new project for her using a lighter color green of the same yarn (which I found in a desk drawer) and the only set of unoccupied needles I could find, which were circulars. 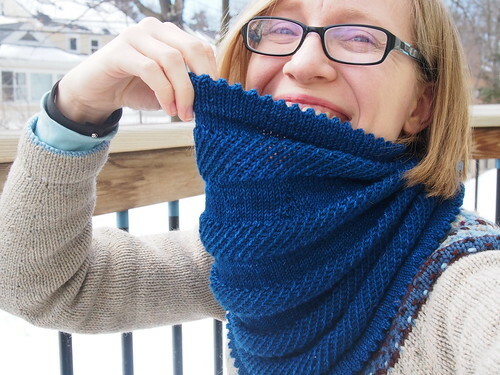 She’d never knit on circulars before, only straights, but she took to it like a champ, and knit 6 full rows of garter stitch! 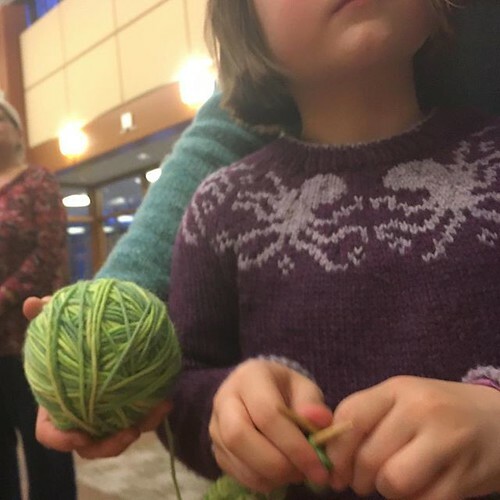 She was so into her knitting that she didn’t even want to stop when it was time to stand in line for Show & Tell, so I held her yarn for her so she could knit standing up. She’s such a little pro! 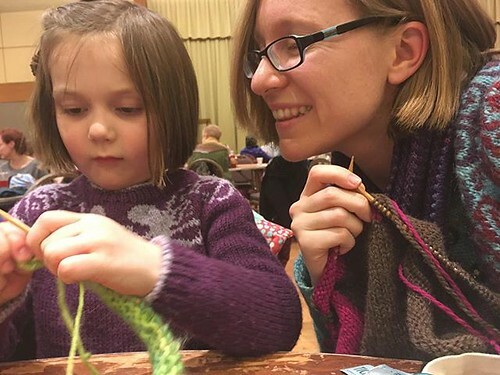 It was really nice to get to spend a little bit of time knitting together with M and my friends before I head out of town for a few days. 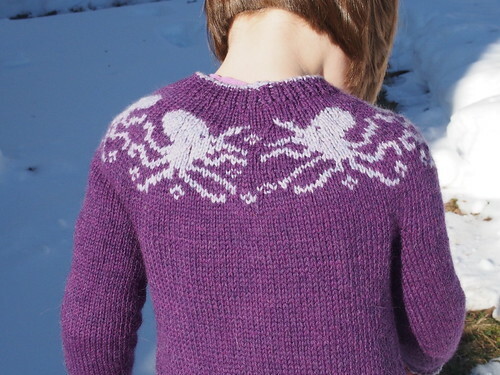 That project I’m working on is my new sweater, by the way…a Winter Traveller in brown and hot pink Cascade Eco Wool. When I finished M’s sweater, I wanted to cast on for something new for me, and I decided I would knit the sweater in my queue whose yarn I could find first, and my Eco Wool bin was the first bin I found, so here we go! It’s my first intarsia project since I first started knitting, and I had to rip and reknit a couple of times when I started the “intarsia in the round” section because it looked like a hot mess, but I’ve got it working now and I’m so excited about it! It’s actually quite a bit further along now than in this picture (I’ve got the sleeve stitches on waste yarn and am knitting down the body now), but you can get a good sense of how the pink and brown work together from this shot. I’m loving it so much! 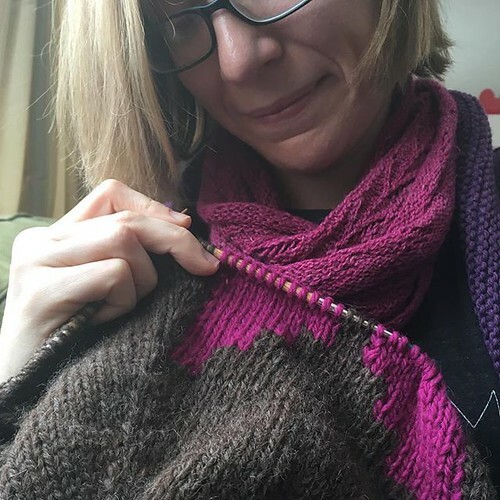 I got a kick out of the fact that the pink of the Nordic Star perfectly matched the pink cowl I was wearing one day when I was knitting it…I’m consistent! It’s pretty much the only pink I’ll wear, but I wear it quite a lot these days. 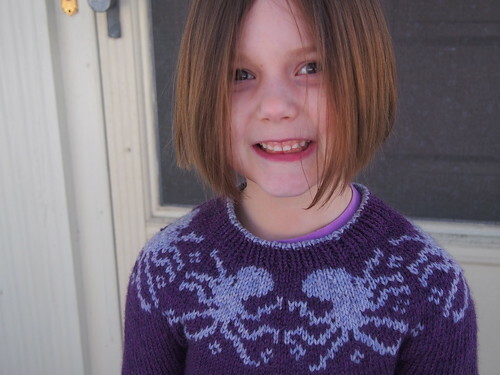 things I make for Maddy: Octopus Yoke! Hi! I’m back from the other side of our move with a finished project! Not finished by the end of January like I planned (moving is hard, it turns out!) but at least while it’s still chilly enough for a sweater to be useful. And it’s a good thing, because due to a combination of tighter-than-swatch gauge (hi, moving stress!) and bigger-than-measured kiddo (hi, growth spurt!) the sweater is a bit on the snug side. But it fits for now, and it looks adorable on her. This kiddo has a LONG torso! (Just like her daddy.) 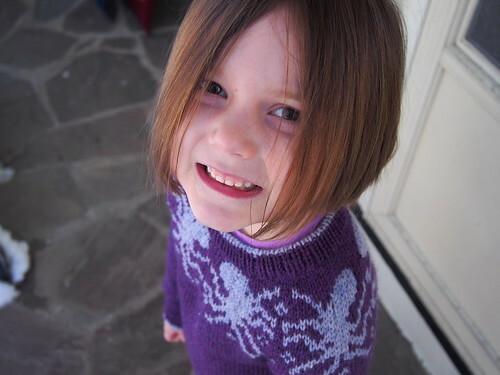 I swear, the body of her sweater is only about an inch shorter than I knit for my own sweaters. She is going to tower over me by the time she’s 10, I think! 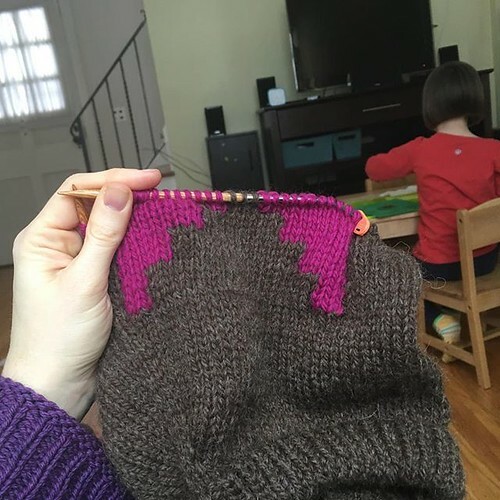 I love the way the contrast tips of the ribbing turned out – that detail was a request that M made, and she’s got good design sense! Here it is from the back. Trying to get those mirrored octopuses was a bit of a brain-twister, design-wise, and I had to add those “bubbles” because the float situation was just too crazy otherwise. I think that the top two tentacles could be a little more distinct – they kind of blur together when they get close to the mantle in a weird way. 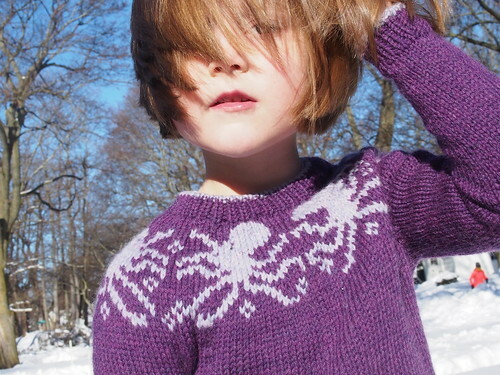 Ah well, it looks pretty darned good, and M is delighted with it, so we’ll call it a win! I’ll close with this shot of my little model! Isn’t she lovely?